In this question on quora, the first answer mentions that for Space Shuttle launches they changed the holding mechanism to explosive bolts from the clamps used to hold the Saturn V.
Why did NASA switch to explosive bolts for the STS? A clamp mechanism appears much more reliable than explosive bolts. Were there any safety features which wouldn't ignite the SRB’s if the explosive bolts failed, or were SRBs powerful enough to simply break the holding force of a bolt in case they didn't explode? The Saturn holddown arms were released pneumatically with a pyrotechnic backup. Please refer to What holds the Space Shuttle orbiter itself stable on the launch pad? for details on the hold-down mechanism. 1) "And also was there any safety feature which wont ignite the SRB’s if explosive bolts fail?" No, the SRB igniters and the hold-down post release were fired simultaneously. At T minus zero, the two SRBs are ignited, under command of the four onboard GPCs; the four explosive bolts on each SRB are initiated (each bolt is 28 inches long and 3.5 inches in diameter); the two T-0 umbilicals (one on each side of the spacecraft) are retracted; the onboard master timing unit, event timer and mission event timers are started; the three main engines are at 100 percent; and the ground launch sequence is terminated, initiating the onboard GPCs. 2) "Or were SRB’s powerful enough to simply break the holding force of a bolt in case they did’nt explode?" Anecdotally the SRB could pull the bolts through the nuts if they didn't get blown apart but with severe trajectory impact. But I have no reference for that. Like any system that has bad effects if it fails, redundancy was designed in. An answer to Could the shuttle wait out the whole burn of SRBs on launchpad in case of a problem on launch? agrees that bolts could not hold down the SRBs after ignition, but it is also unreferenced. Late in the Space Shuttle Program a problem called "stud hangups" was worked on. This refers to an incident where the bolt is not cleanly ejected through the bottom of the stand and the SRB gets bound up on it. The dynamics of the SRB freeing itself from the bolt were visible in the onboard accelerometer data. Most stud hangups were of a single bolt, but twice a dual hangup occurred. There was a concern raised that a quadruple hangup (never experienced) could cause structural problems with the stack. To increase reliablity of the system even more, the redundant pyro initiators were cross-strapped, so that if only one fired, it would blow the other one. On the launch of mission STS-112, one of the redundant systems (system A) on the hold-down posts and the ET vent arm failed to charge up, so half of the redundant pyros failed to fire. The problem was traced to corrosion in a connector. Corrective action was to inspect the connectors for the remaining launches in the program. The cross-strapping mentioned in the previous item would also mitigate this problem. 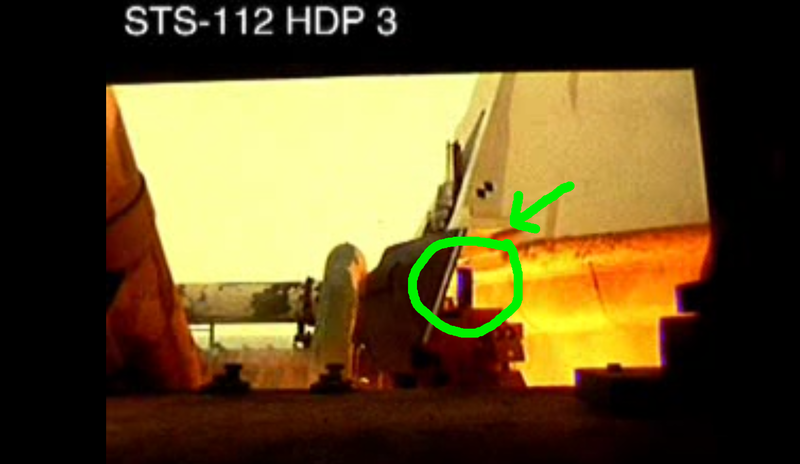 Here's a frame from STS-112 engineering video showing a stud hangup (green). In a normal launch, the bolt preload would have caused it to retract into the stand by this point. The STS video linked in the question shows a normal launch view of this hold-down post at about 1:21. Not the answer you're looking for? Browse other questions tagged space-shuttle saturn-v mechanism or ask your own question. What is the mist on Saturn V during launch? Saturn launch precautions for clearing tower? How was the thrust for the STS-94 launch and other space shuttle launches balanced?